The universe of social networks is various and exciting. The phenomena creating inside it may produce standardized and confused chain reactions or generate strong connections, like Co-De-iT, that turn “digital friendships” into solid and productive relationships, capable of growing and structuring as long as they evolve, up to constitute an important element in a global scenario. 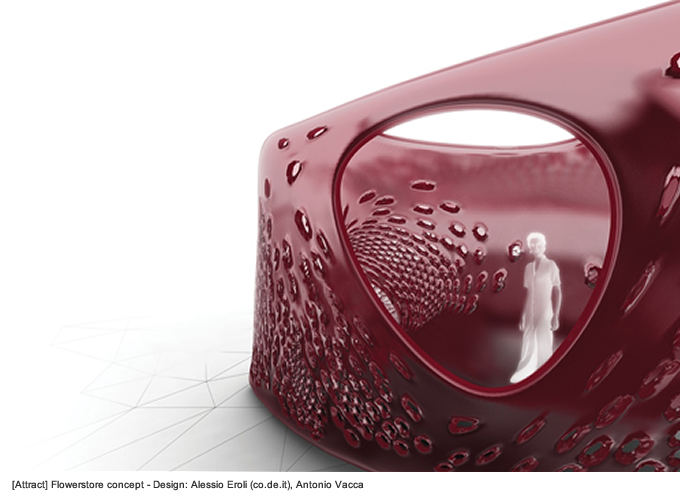 Co-De-iT is an independent group of research on digital and scripting-based architecture, born in Italy yet strictly connected with the rest of the world. Their activity is guided by a mission: to bring to Italy some innovations usually characterizing other most advanced international contexts. The request for innovation is clear and concrete, as confirmed by the interviews with Andrea Graziano, Alessio Erioli and Davide Del Giudice. 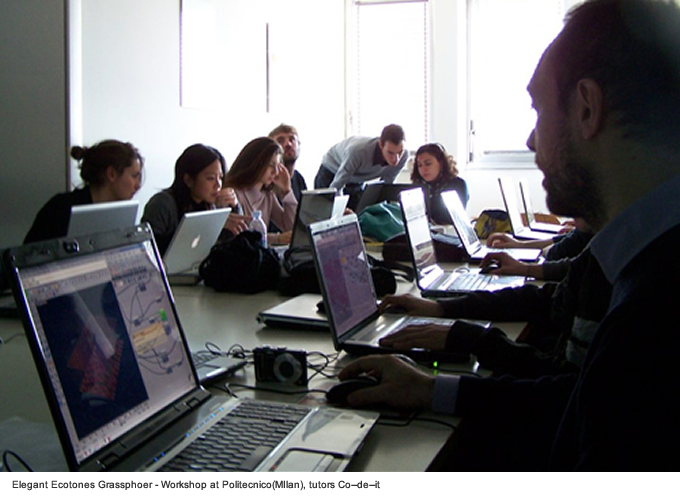 A more and more increasing number of students and professionals rely on Co-De-iT, attracted by its hub role for all those information and projects that encounter problems in penetrating the Italian context. 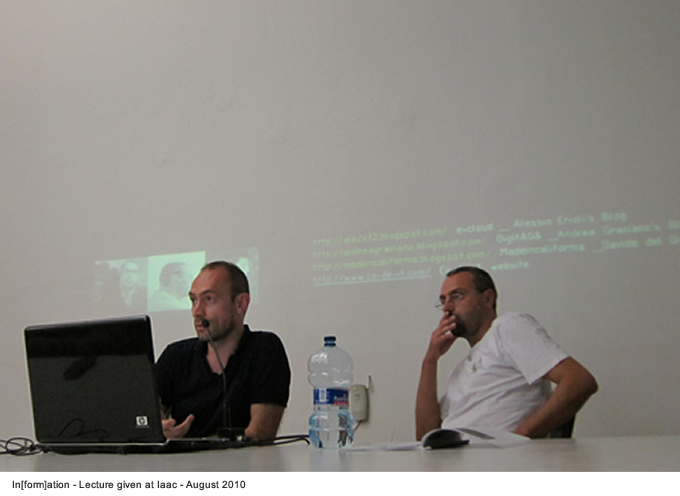 The history of Co-De-iT, born in the net as a passionate exchange of information on architecture and digital fabrication, followed up with a series of blog, and materialized through AAST event (Advanced Architecture Settimo Tokio: conference, exhibition and workshop on digital architecture, hosted in Turin in 2009) and then as educational networking in a constantly expanding system. 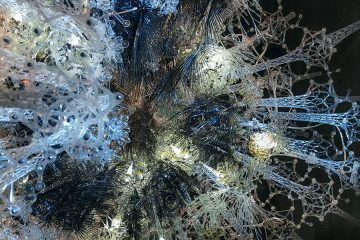 Next March 1 and 3, for example, Co-De-iT will be directing a series of workshops and lectures called Intensive Aesthetics near Barcelona’s Biological Architectures & Design Conference. The Co-De-iT system was born out of the complexity of the net, becoming more and more adaptive and resistant and generating possibilities that, according to its curators, will overcome the initial properties that produced it. 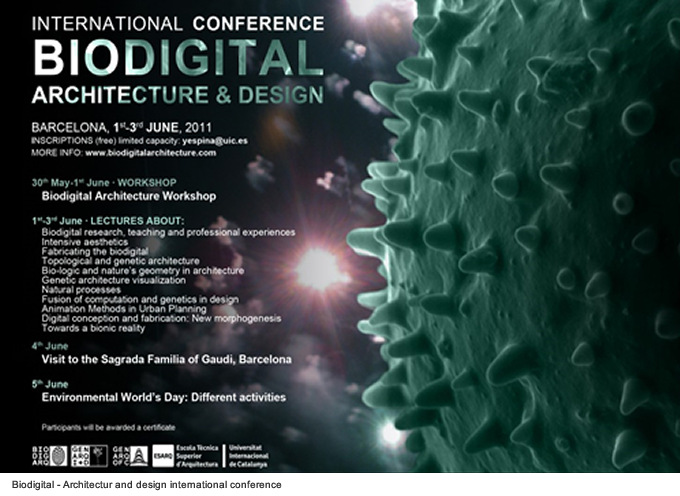 Sabina Barcucci: Co-de-iT speaks for itself: please tell us how it was born, how it is growing, how it operates and enters the panorama of research on advanced design and where its wide network comes from. 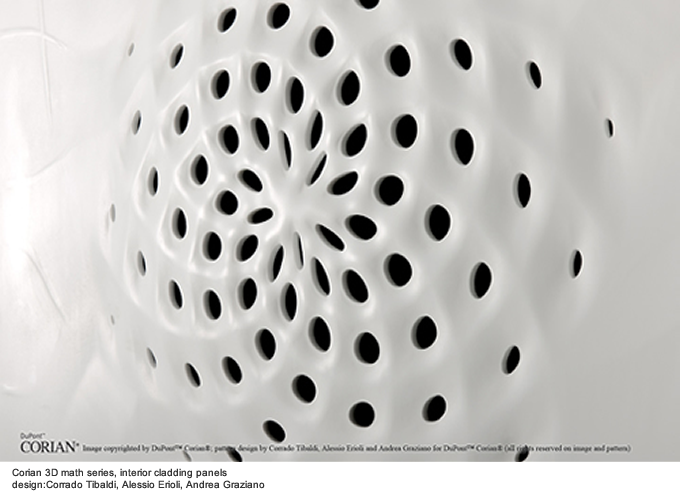 Andrea Graziano: Co-de-iT was born in January 2010. Its history started by “digital friendships” on the web and shows how the net has become our natural field, inextinguishable source for our interests and research work, and territory of exchange where every day we plunge in, participate and try to contribute personally. Each of the members of Co-De-iT has a different and personal attitude towards the net and its usage, but we share a same multidisciplinary approach. Most of the latest events of computational design and architecture research has deep roots in other fields, and the high amount of current research and experimentation works filling the net have their strongpoint in multidisciplinarity and spreading among different areas of knowledge and savoir-faire. In general, I think Co-De-iT could be depicted as a hub, through which we try and aggregate, connect and direct resources, information and knowledge (and people as well) depending on opportunities and needs. For what concern our modus operandi we are trying to do our best to work on more fronts. One of the most important ones is no doubt information spreading. Each of us handle a lot of information (sometimes maybe too much), through official sites or personal blogs, Facebook, Twitter and forums. We deeply believe that in order to make what we do more comprehensible and give value to the matters we deal with, it is necessary, or even strategic, to provide the spectators with all the tools allowing to understand culture, theory and process laying at its base. That is why we think one of our most efficient instruments is to make information available and accessible through our channels, if we intend to contribute in changing the reality of things. Another front on which we are fighting on lately is training through the arrangement of various workshops both about the use of tools and techniques for generative design, and about introducing machinery for digital fabrication. We are trying to give value to the cultural context, transmitting not just mere technical notions, but also patrimony of resources surrounding us. Being Co-De-iT a group of research, the greatest part of our work lies in experimentation itself, yet what I would like to make clear is that our interest is not only focused on design or architecture planning, but on a wider and better analysis of the phenomena involved. Our energies are also turned to the experimentation of new models of communication and training, information managing, data visualization, production. In other words we are trying to turn spreading and variety of interests into valid instruments that should guide our research. Sabina Barcucci: There is a rising debate about reactive environments and need to project architectures and spaces in compliance with exterior necessities, from atmospheric agents to – taking it to the extreme – market’s inflections. This field of research has a very wide range of applicability. What are your experiences in the matter and what the most important values the research on responsive environment could follow, in relation to all the improvements brought by this advanced technology? In other words, will be ready for this kind of future? 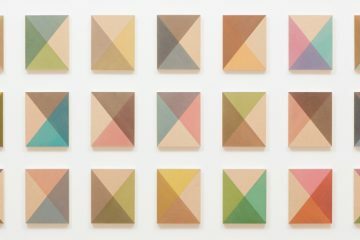 Alessio Erioli: The World in which we live, move and operate is a complex adaptive system, or a system continuously defining their borders and limits: the concepts of subject and environment are relative (the distinction itself belongs to an already obsolete logic) and the borders separating them are blurred. Architecture, in its aspect of artefact produced by a species that lives collectively, has always been the mediator between material systems, physical-environmental pressures, cultural, economical, political and social powers. The point is that adaptation times to changing, which in the past had different size among architectural works and estimated life, got closer and closer, up to reveal change as a perceivable condition, searching for equally rapid answers and adaptation periods. Organisms and environments are in constant communication. There is a continuous exchange of information (under the shape of language, matter and energy) we can only perceive a part, because our limits are also operative needs (there is a limit for the amount of information we can handle – a limit in constant definition yet somehow always perceivable). Technology is just one of the aspect influencing evolution and search of new solutions, and it is often mistaken with its products. To this purpose, we found Kevin Kelly’s vision of technology very interesting: not a pile of wires and metal, but a veritable organism with needs and habits, living in symbiosis with us, influencing our existence, whose we are the reproductive organs at the moment. We often think of technology as something visible and distinguishable (or vaguely alien), and in many cases as something opposed to what it is “natural” while, for instance, we take the irreversible influence of web on our lives for granted (even the simplest of calculators can boast this phenomenon, and in general each technology we use). One of our most important goals for design economy (research, training or project) is to absorb and extend the study of systems (with a range of different scales, depending on the system’s complexity and extension) that handle these exchanges of information incorporating a rising complexity so that resilience could increase. The term resilience indicates a system’s capacity to absorb any trauma caused by violent changes by adapting to or protecting from them. There are properties and strategies that can be encountered in ecosystems and increase their resilience, such as heterogeneity, high number of constituents, redundancy and continuous communication between system’s elements for example (just to mention the most interesting ones). We believe it is possible to explore these strategies in architecture (in product, formation process and even in our work-flow) for a better adaptation or response, searching for a metabolism of information, a digital metabolism. In a certain way, if we would just hold onto to the mere prevision of the effects, we will never be ready for the future, but we could become more adaptable to change. 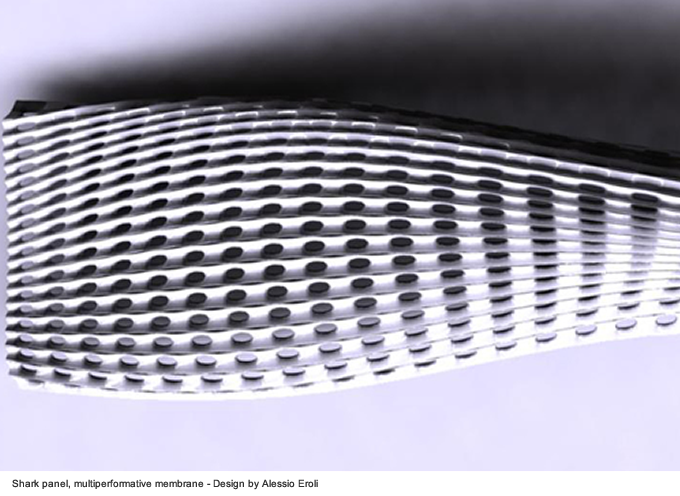 Sabina Barcucci: In each area of design, our research takes the form of experimentation and sharing of technology, so that our knowledge of design could be integrated with contemporary ideas. Gyorgy Kepes, founder of Centre for Advanced Visual Studies (CAVS) at MIT, consecrated the structure to the creative collaboration between artists and scientists. 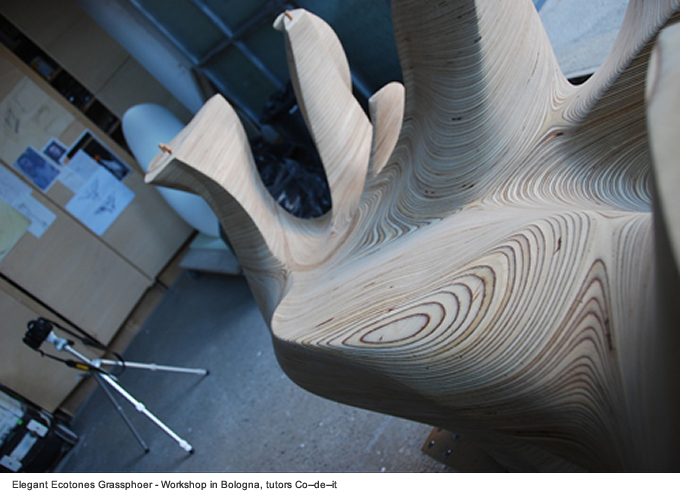 In phenomena such as the diffusion of digital fabrication, we can find some efficient relation example or discipìlinary crossing, approaches more and more necessary to “invent” and satisfy the complexity in which we live. 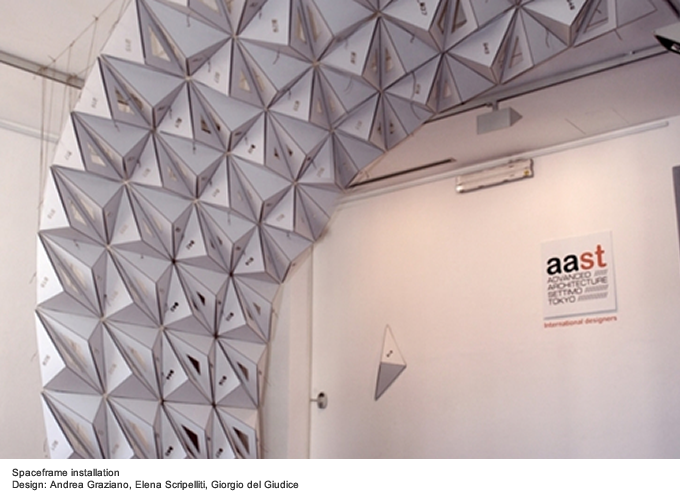 Thanks to digital fabrication applied to architecture, the potentialities of art are integral parts of scientific-technology performances. Let’s talk about this art-science union in the cad-cam experience linked to Co-De-iT. 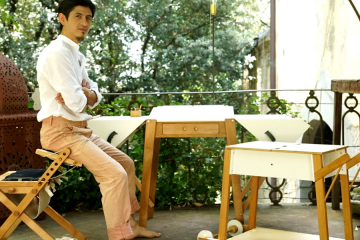 Alessio Erioli: Protrude, Flow and Morpho Towers are two installations by Sachiko Kodama and Minako Takeno that use ferrofluid and magnetic fields to build highly dynamic and emotional structures. 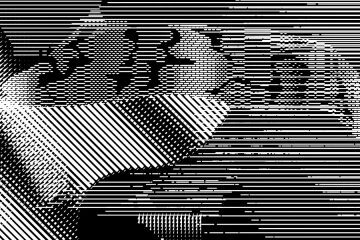 There are also artists working entirely on digital codes (such as Jared Tarbell, Casey Reas and many more). Did ever exist a clear distinction between two so complex fields like art and science? 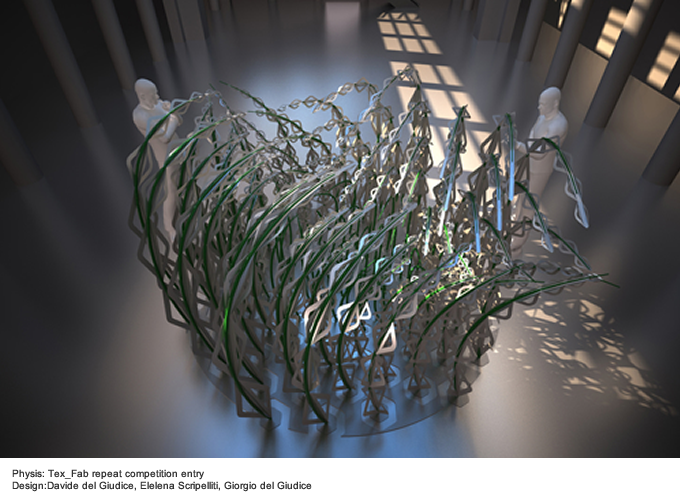 In our opinion, the terms defining them indicate points of reference in a turbulence field rather than rigid and exclusive classifications: just as every form of art has always prospered thanks to scientific and technologic innovations (often providing them with roles and goals), so too every technology produces an aesthetics of its own (that alters, crossbreeds or replaces the existing ones). Moreover, the importance of creative approach in science and disciplinary rigor in artistic research cannot be denied. The territory of intermediation is the most fertile and full of interaction patterns (generally meant as sequences in space-time or forms with orders on their own, from the simplest to the most sophisticated) that are routes and directions leading to good results. Rather than starting from different categories among which to search for points of contact (an obsolete method by now), we prefer to consider ourselves as patter seekers: we try to extend the possible applications of the process we study without caring too much about their eventual classification or disciplinary outcome. Instead, our goal is to evaluate potentialities and performances as long as process and research show themselves. MIT’s “secret” is its mentality, whose ties contribute in revealing exploration routes where, as rules of a game giving birth to schemes and strategies, the formation background of each part is seen as a specificity basin that grows richer and richer with its diversity of solutions. During our experimentations and fabrication works we do not aim to a determined object only, but rather to the exploration and discovering of mediation instruments that pave the way for most complex interactions; as for the concept of “territory of intermediation”, our intent is to explore the “development scenarios” (expression coined by Sanford Kwinter with reference to the code) generated by those instruments. We are experiencing a unique occasion on a fabrication level: an increasing democratization of technologies with a rapid diffusion and sharing of strategies, methods and projects. In other words, this is an extraordinary creative instrument, more and more accessible to everybody and in fact everybody uses it, by inserting it into specific disciplinary fields or by freely exploring a world filled with potentialities still to be discovered. Sabina Barcucci: Broadly speaking, “Knowledge” has taken a new form. In the net, many great gnoseological systems, from the most traditional to the most experimental ones, are distributed freely under different forms and different levels of usage. The freedom to access plus the interactive combinability give something similar to knowledge mass-customization, oriented and created by a collaborative thinking that often comes out of social networks. By starting from this Zigmut Bauman’s idea, it seems like the pillars of knowledge are melting and spreading around, so that they may create room for new cognitive, educational and didactical forms. Let’s talk a little bit about that. Alessio Erioli: First thing first. We think knowledge is in constant creation everywhere, and not only within the places conceived for that purpose, because it is not just a product but above all a process strictly linked to vital ones. At the same time, the means through which we create it interact with our way to conceive the models producing it. It is definitely true that new forms of knowledge, alternative to institutionalized formation, are appearing, and due to their simplicity, these are fierce competitors in the struggle for resources. Nevertheless, we do not share Bauman’s pessimistic vision, nor we agree with the simplification of the liquidity metaphor in order to describe society. All that was said in the previous answer about the spreading digital fabrication implies that each individual is a potential consumer, producer and creator of his own resources. In this sense we do not know if the liquefaction is the right concept to express what it is now happening to knowledge, because melting implies an homogeneous and inert distribution; we prefer to explain the phenomenon as a form of distribution, different from knowledge, using networks and system of information models (with different levels of quality, importance and function), in which the continuous exchange creates patterns with lots of unexpected and surprising implications, and encourages constant interexchange and communication. As explained before, constant communication is one of the fundamental aspect for a system’s resilience, even if the most complex systems are also the most sensitive to perturbations and thus more subject to violent responses (and quick collapses too). It would be wrong to formulate a replacing thinking though: the fact that knowledge is online does not a priori deny or prevent schools and universities from playing a key role; should this be the reason, universities could already be closed, for one could even built an online PhD without using any of their filters. The force of a new mode of knowledge distribution and transmission is indeed changing radically the scale value and the level of quality these modes are classified. For example, being internet a copy-machine, everything that could be reproduced on internet takes a value prone to 0: uniqueness, originality, capability of improvisation then take a new value, by reconfiguring in order to integrate the qualities new means can lead to. By excluding faculties such as sociology, studying at a phenomenological level mass expressions linked to media, what is the current number of institutions offering education and explanation for the role of social networks in handling information and influencing knowledge? We think that knowing how to organize knowledge is just as important as understanding its contents. As for collaborative thinking and any other attempt to ethically control interaction systems, it is useful to remember a fundamental rule that goes well both with genetics and memetics: survival is in the hand of those capable of reproducing, or creating copies of themselves. In other words, if a technology or idea is capable of reproducing more easily, it is certainly going to do that, regardless of the consequences. Moreover, by considering the characteristics of the emerging properties of complex systems, any action, on any scale, cause effects overcoming the initial properties of the system that produced it. Sabina Barcucci: For what concerns the more local context where Co-De-iT operates, what is your attitude towards the spreading of innovative educational practices within the Italian universities? Andrea Graziano: Obviously Italian academic contexts reflect the cultural context of Italy as well, for better and for worse, with each controversy and peculiarity. 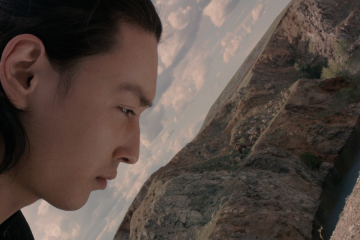 In general I believe we suffer from a certain isolation, even cultural, in relation to the International context. 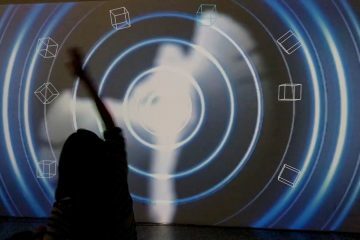 As for computational design, advanced architecture and digital fabrication, they were seldom dealt with during specific university courses and conferences, or in almost unique cases where new and often unprepared generations of teachers were automatically trying to bring about changes. No doubt my evaluations take into consideration the situation of research and university in Italy, where the lack of funds heavily influence the opportunities for a general development, and within universities as well. All the more so we consider worse the fact that no resources have been spent, both politically and generally, on research and formation as fundamental means necessary to face the current period of crisis and the rapid changes we will be forced to reckon with in the immediate future. Anyway, we think that confrontation will be, or better it is already inevitable, when facing strictly architectural matters and cultural ones, and this prolonged isolation will increase the gap that every day becomes more and more visible, urgent and unpleasant. A clear symptom of all of this is the largest and evident students’ interest to information flows, workshops and works we organized along with networks, as well as the continuous and appreciated request for bibliographic references, links or masters and doctorates. Behind this thirst for knowledge, due to adequacy rather than novelty, the students are not at ease by living a clear contradiction between what is everyday shown by the net culture and what the academy stubbornly provides them with. However, this increasing gap is also bringer of huge potentialities because the energies spent, the curiosity and the desire to emerge will be the base for uncommon and important explorations, researches and solutions. Now more than ever, we think this moment of crisis will reveal the best people, resources, strategies and tools to find a way out of it.